In 1988, the Lions Club International (LCI) created the Peace Poster Contest for children aged 11 through 13 to encourage young people to express their visions of peace. In 1998, Eddie Hui (Past District Governor - Edison Lions Club District 16D) made the contest availible for Chinese American children in New Jersey. People have been through several world wars and other conflicts, where many lives and property were lost or destroyed. Although progress has been made, such as tearing down the Berlin Wall to unify Germany, it was a drop in the bucket. We certainly don't want to repeat these devastating events, which is why it's important that we continue to spread and promote peace. 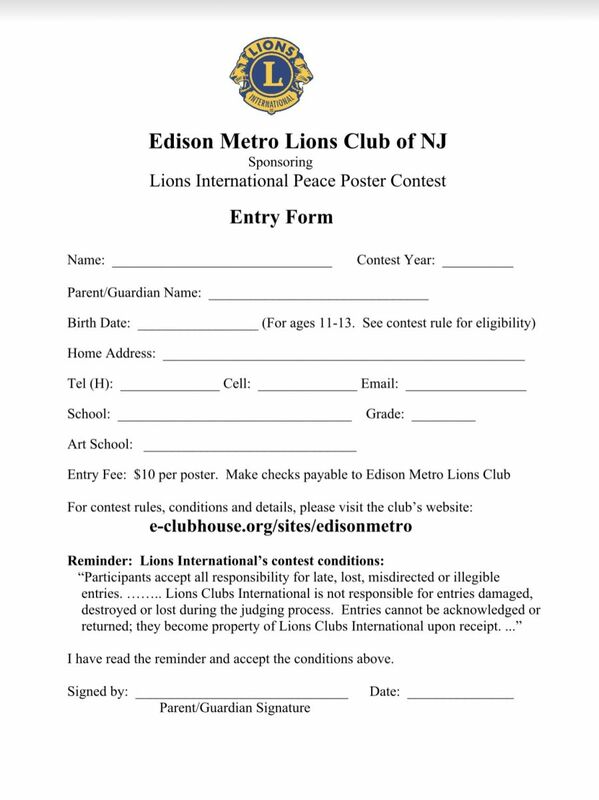 Winners of the Peace Poster Contest can receive local, statewide or even worldwide publicity and recognition. The grand prize winner receives $5000 and the other 23 merit award winners receive $500 each, along with an award certificate. The Peace Poster Contest is one of the best events to promote peace. It also brings out the artistic talent of young participants. 1. All posters must have dimensions no smaller than 13 inches by 20 inches and no larger than 20 inches by 24 inches. Do not mat or frame artwork. 2. Words or numbers in any language are not allowed on the front of the poster. Write student’s name, address, birth date, names of school, art teacher, parent or guardian , home/cell phone numbers, and email address on the top left side in the back of poster. In addition, write your short peace quote or your idea or concept of peace. 3. All media (pencils, crayons, pens, markers, paints, chalk, etc.) are accepted. Note: Chalk, charcoal or pastel entries should be sealed with a fixative spray to prevent smearing. 4. No photographs may be used. No three-dimensional entries. Nothing may be glued, taped, stapled or attached to the artwork in any way. Entries cannot be laminated . All entries must be flexible enough to be rolled up for shipping in a mailing tube. Do not fold poster. 5. Each student may submit only one entry, and each entry must be the original work of only one student and should fill in this form completely. 6. Entries cannot be acknowledged or returned; they become the property of Lions Clubs International upon receipt. Participants accept all responsibility for late, lost, misdirected or illegible entries. Lions Clubs International is not responsible for entries damaged, destroyed or lost during the judging process. The winning poster from our club will be advanced to the district semifinals, where there is a chance to progress to the multiple district and to the international semifinals . Please visit Lions website www.lionsclubs.org for more information. Congratulations to Emma Fang for winning first place for the 2018-2019 Peace Poster Contest in New Jersey!